Do you know, a good charger can add more value to your battery!? Additionally, the performance and the lifetime also depended on your charger’s capabilities. Like other type batteries, a deep cycle battery also needs the perfect charger for it as it needs to survive and serve for a long time. We receive so many queries from our users about the basic features of a good quality deep cycle battery charger, how can they choose the right one for their batteries. If you get the wrong one in any chance, it may cause damage to your batteries. So, choosing the best one isn’t too easy. You need to check the requirements carefully to find the suitable one. In this incident, we are here to you as a helping hand to choose the best one. In this buying guide, we have reviewed here top 5 models of the deep cycle battery charger that might be best for your battery. We reviewed details about them. Additionally, we have included a buying guide so that you can choose more perfectly. What Size Charger Do You Need for Your Deep Cycle Battery? 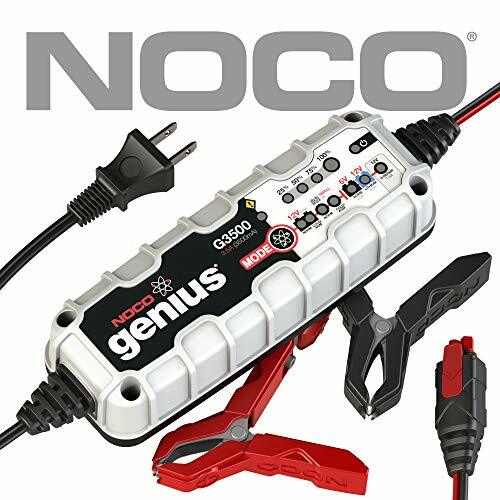 NOCO Genius is a well known brand worldwide for making battery charger. NOCO, the manufacturer has brought this awesome charger with many innovative and helpful features. First of all, this charger is able to charge lithium ion and lead acid batteries at up to 120 AMP/ hour charging rate. Basically this one can charge your batteries 2X faster. And the charger is compatible with most battery types such as marine batteries, trolling motor batteries etc. This is a 12 volt and 6 volt charger as well as a battery maintainer. This charger has ability to repair your damaged batteries besides maintaining. The cutting edge technology of the charger delivers you the superior performance. Additionally, this charger can be used with vehicles of micro-hybrid start-stop and CANBUS type electrical system. The innovative streamlined design of the charge has made this portable, incredibly lightweight and ultra compact (7.7x2.7x1.9 inches). Additionally, this charger offers rubberized base and external mounting holes that avoid scratches and surface slipping. On the other hand, the charger is Ultra Violet (UV) ray and water (IP65) resistant so you don’t need to be worried about protection. This device has ability to monitor battery activity to ensure efficient & safe charging. This feature minimizes the energy consumption as well as overcharging protection & reserve polarity. However, this charger comes with included spark proof technology. Another amazing feature is the charger has intuitive LED light indicators that provide charging state feedback visually. Additionally it provides diagnostic information too. This is always active even when the charger is in maintenance mode. 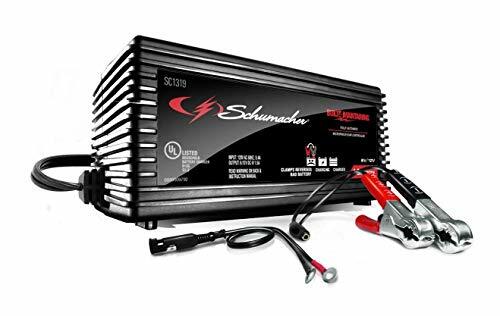 The Schumacher SEM-1562A-CA 1.5 Amp is one of the famous deep cycle battery chargers. This pretty good charge can charge both 6 volt and 12 volt batteries. This is a microprocessor controlled battery charger. The innovative microprocessor controlled charging system is the easiest way as well as safe system for the batteries. Microprocessor can charge and maintain the batteries at optimal power level. Also, the charger can give you a speedy & convenience experience. This innovative charger also offers automatic voltage detection which determines whether the connected cell is 12 volt or 6 volt automatically. This feature eliminates the possibility of damaging the batteries. Because choosing wrong setting can harm the battery. This smart feature can do process automatically of charging and maintaining for multi batteries once your batteries are identified. The charger has constant monitoring battery feature which can charge the batteries efficiently, accurately and swiftly when needed. This feature also allows charging cycle to click ON/ OFF in same way. For this feature, your batteries can be attached with the charger for storage indefinitely without any kind of risk of damage or overcharging. Additionally, this innovative charger has automatic temperature compensation that can adjust with minimum maintain voltage & maximum charge voltage based on ambient air condition. The thermal runway of the charger reduces the current if the charge detects the battery is getting to hot, and this is an automatic process. Unless it finds a proper connection existence, it keeps the power from flowing with its “auto Start” feature. However, the Desulphation mode allows the batteries left disconnected for and extended time period. It also keep the batteries ready overnight in cold season. The dimension of the charger is 7x7.5x11 inches. The charger is compatible with most batteries for classic cars & motorcycles, small batteries, ATVs batteries, boat batteries or marine batteries as well. Also, the LED light indicators and the automatic switch are wonderful added more value to this charger. Rough plastic housing for charger. The Tecmate OptiMATE TM-181 is another amazing charger from our top picks. This is the most advance deep cycle battery charger. 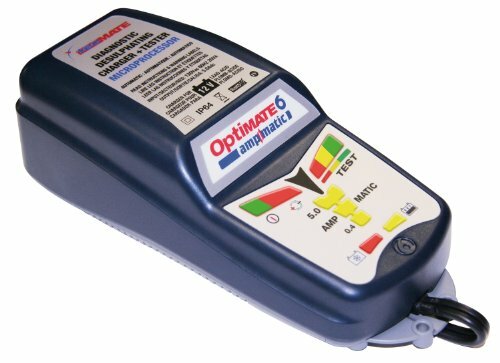 This fully automatic charger is a 12 volt charger as well as battery tester and maintainer. This smart charger can recognize the difference between sulphated & discharged batteries that other charger can’t. This charger offers charging from a low volt of 0.5 along with 2 steps of desulphation recovery. This charger has waterproof case so you don’t need to worry about damage by water. On the other hand, the charger offers wall mounting and standard battery clips. The battery offers 100-240 volts 56-60 Hz of input with fully sealed high efficiency. The charger has automatic control with the cell of ampmatic current. Additionally, another innovative feature is the charge warns you early of any battery problems. Also, the battery has automatic storage control that optimizes the battery power & battery life. This one is perfect for long time maintenance of any sizes of 12 volt lead batteries for marine, deep cycle, automotive or motorcycle. The multi phase desulphation of the charger helps batteries from being dead early. The smart Ampmatic control can easily adjust the current to connected batteries of any size (3-240 Ah). It is able to charge your battery faster and the automatic and interactive float charging mode is enabled when the battery gets full charge. This package is a 3 in 1 solution- charger, tester & maintainer. The dimension of the charger is 12.3x7x3.4 inches. Automatic storage control of batteries for 24x7. You charge only 12 volt batteries where other chargers offer both 6 & 12 volt charging. 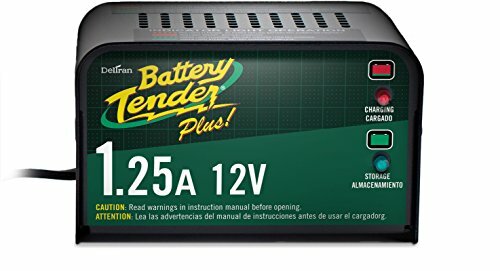 This one is a smart deep cycle battery charger from the manufacturer named Battery Tender. This is a smart charger that offers 4 steps of charging program. Those are Initialization, Absorption, Bulk Charge and Float Mode charging. The charger is designed to maintain & fully charge a battery in a proper storage voltage without any kind of damage that can be caused by tickle chargers. Additionally, this charger comes with included quick connect harness that are hard to reach. This charger has automatic switch feature that enable the mode to floating charging when the battery get full charge. On the other hand, the charger also offers temperature compensated feature to ensure optimum charging voltage according to the ambient temperature. The charger is able to charge the batteries faster as well as it has safety feature against reserve polarity. This charger can charge as fast as 3a charger or faster. The Green & Red indicators of the charger help to operate the operation easily. The lights flash in various conditions alternatively. The charger comes with included Alligator clips and battery tender ring terminal. The dimension of the charger is 11x4x11 inches. Presents automatic switch from full charge to float charge mode. Power cord could be longer. 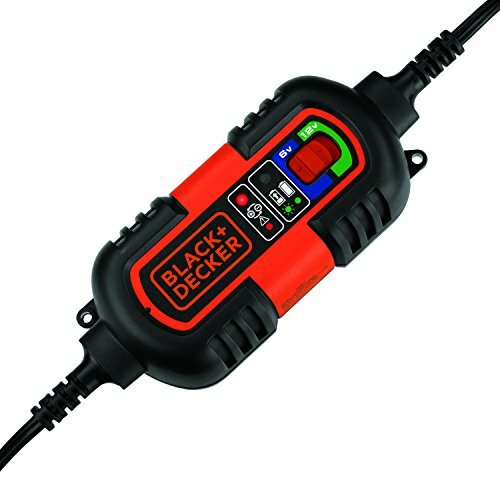 The Black & Decker BM3B charger is a smart charger that can charge both 6 volt and 12 volt battery system. This charger is compatible with almost all types of battery such as Gel, Wet and AGM batteries. This is a compact charger with built in mounting option. The dimension of the charger is only 5x9.8x3 inches. This device has included vehicle DC plug, “O” ring terminals and battery clips so along with these, the charger offers a very easy connection with vehicle batteries. It is able to keep optimal charge to the battery with smart and high frequency charging technology. The charger has automatic switch feature that enable the mode to floating charging when the battery get full charge. Also, the charger offers floating mode monitoring system. With the built in mounting bracket, the charger can be mounted easily. This charger is compatible with various types of batteries like antique & classic car battery, RV battery, vehicles battery, deep cycle marine battery, lawn mower battery, ATV battery, snowmobile battery, personal watercraft battery, motorcycle battery and many more. The DC connector cable for vehicle is a great including to this charge and it adds more value. And, along with charging the batteries, this one is a battery maintainer too. This charger can also take care of your battery and ensure longer life and performance of the battery. Additionally, this charger also has safety protection against dust, oil and moisture. Smart charger with smart switch. Low charging rate; take more time to charge larger batteries. Well, people usually ask what size charger they need for their deep cycle batteries. For answering this question, you need to know how many AMP/ Hour do your batteries store. The size of the charger depends on it mainly. It is known to all that more current putting in the battery means faster charging. But a large charger on a small battery is harmful as it leads to venting and boiling electrolyte. This damages the battery and shortens the battery life. For the better idea to find out what size charger you need, you need to know the following things. Flooded battery can accept 25% charge rate of its capacity. Gel battery can accept 30% charge rate of its capacity. AGM battery can accept 40% charge rate of its capacity. This means charge is accepted by the battery depends on battery chemistry. For an instance, if you have 100 Ah flooded battery, then it will be recharged with a 25 Ah or less charger in about 4 hours. Even the battery was completely dead. If you have hurry, then you need large charger, but if you don’t have hurry then it’s better to go for a smaller one. Choosing the right charger is very important for your battery as your battery life and performance are also depended on it in. if you pick the wrong charger, then you won’t get the desired performance from your batteries. To choose the right one, you need to look after mainly 3 major requirements. There are various types of batteries such as Absorbed Glass Mat (AGM) batteries, Flooded (Wet Cell) batteries and Gel Cell or Valve- Regulated Lead Acid (VRLA) batteries. Generally, one charger can charge all type batteries expect Gel Cell. So, check your battery type before choosing. Well, we do not mean the physical size of the battery by saying that. We are talking about how many Amperages hours your batteries store. For instance, if you have a full size typical auto battery that is of 50 AMP hours and you choose 10 Amp charger, then it will take 6 hours to recharge the battery fully even if the battery were dead completely. For another example, a 100 AMP hour deep cycle marine battery requires a 10 AMP hour charger for about 11 hours to recharge fully a nearly dead battery. To calculate the total charging time, take battery AMP hours rating and divide it by charger AMP rating. And then add 10% extra time to complete charging fully. Now, select charger for your battery. You may choose smaller AMP rating charger if you’re not in hurry. If you need the charger for motorcycle, aircraft battery, classic car, trolling motor battery or wheelchair battery, then a low AMP charge will work fine. But if you need to charge quickly, then you need powerful and fast charger. So, choose charger by thinking about the outcome of the charger. And don’t forget to check the special, safe and innovative features like water & UV ray proof or other smart capabilities. Another important thing you should consider before buying a deep cycle battery charger is battery chemistry. Because generally, you can’t use a lead acid battery charger to charge a gel unit or vice-versa. Only if the battery clearly mentions that you can use one charger to charge both of them. Deep cycle battery chargers come in different amp ratings. So you must check the number of amp hours that your battery can store, with which you’ll be able to decide which one your battery needs. You also need to calculate how long the amp charger takes to charge your battery simply by dividing the amp hour with the amps of the charger has. Hopefully, we could have helped you to figure out the best one for your batteries. We picked here top 5 deep cycle battery charger with detailed review. We highly recommend these chargers as they have the abilities to take proper care of your batteries. Additionally they are able to satisfy users and they did. Just pick that one which is mostly fit with your applications. And if you have any question or enquiry then just leave your valuable comment. We’ll get you soon. Best of luck.